To ask other readers questions about Imagine Me Gone, please sign up. Is it a good idea to read this book if you have depression? Mary Berger I wouldn't recommend it. As someone who has dealt with mental illness in his family, I found Imagine Me Gone so honest and redemptive. Adam Haslett confronts the tough questions that come with loving someone in pain: how much do you try to save someone before you have to let them save themselves? How do you act with compassion when it feels like everyone needs more than you had to begin with? Where do you draw the line between wanting someone to live for your own sake instead of their own? These questions and more rang through my mind as I finished this book, along with gratitude that Haslett crafted such a somber, moving story of a damaged family forever in the process of healing. Approach this book if you can stomach sadness; avoid it if you search only for happiness in your stories. Haslett's novel follows a five-member family that begins with Margaret and John, who marry each other in 1960s London even after Margaret learns of John's secret, devastating depression. The rest of the book unfolds in decades and includes the perspectives of their children: troubled and frenetic Michael, who obsesses over music and racial justice, resolute middle-child Celia, who serves as the rational backbone of the family, and attention-seeking Alec, whose flair for drama hides a love that Margaret deems the most simple and unquestioning of the three. The family struggles and at times succeeds in caring for one another over many years, and they intensify their efforts to support Michael as his well-being deteriorates as more and more time passes. The characters in Imagine Me Gone exemplify quiet resilience. Haslett imbues each member of the family with nuance and depth. They come most alive in their interactions with one another: how Celia listens to Michael's fanatic rambles, how Margaret pays for his bills without question, how Alec attaches himself to all their problems and cannot let go. Each family member tests how deep and how far they can extend themselves for one another. Sometimes they fail, which makes them the most human of all. I loved Haslett's careful, genuine approach to addressing mental health and illness in this book. He avoids glamorizing any of the characters' pain and renders them three-dimensional, giving them interests and quirks alongside their battles. He tackles the complexities of mental illness from multiple angles: Michael's fraught and damaging dependency on medication, Celia's profession as a therapist, and the family's shared trauma surrounding John's depression. Imagine Me Gone raises important questions about mental illness as the topic gains more attention in public discourse. As any good therapist would treat their clients, Haslett puts his characters first, and his compassion for them shines even when the novel itself feels shrouded in darkness. Anyone one who has any type of mental illness, or who has a family member or friend who has struggled with one knows how pervasive it is. All consuming, bigger than life itself, so it is not surprising that this book is very difficult to read, disturbing and heartbreaking. Yet, the author does a wonderful job explaining not only the inner life of the sufferer but giving voice to all family members. He treats his characters, with insight, respect and compassion. Michaels story is the most impactf Anyone one who has any type of mental illness, or who has a family member or friend who has struggled with one knows how pervasive it is. All consuming, bigger than life itself, so it is not surprising that this book is very difficult to read, disturbing and heartbreaking. Yet, the author does a wonderful job explaining not only the inner life of the sufferer but giving voice to all family members. He treats his characters, with insight, respect and compassion. Michaels story is the most impactful in this novel, his story like the illness itself is large, larger than the other family members who tell their stories. This family though, has suffered plenty already and it is amazing how they all care for each other, try to take care of each other. Protect their mother and try continuously to help their brother. We get a pretty clear picture of Michael's illness, his obsessiveness, through his musings, his outlandish stories but the author also tries to show Michael as a person separate from his illness, his interest in music and his record collection, black history and reparations. Although everything he does is carried to the extreme, anxiety ridden. This is not a book for everyone. It is plenty sad but it does show family unity, family and friends caring for each other, tying their best to get on with their own lives while still being there for the person, brother, son who needs them the most. Update: 4/20/16 I wrote this review yesterday. I'm still thinking about this family -and the challenges they lived with. After talking to a friend about a disturbing scene-- I have chosen to 'update' this review --to give a 'warning'. I don't want to give spoilers --but I think its fair to say --that this book might not be the best choice if you are living with a loved one who is very depressed, or suffers with a mental illness. That said....its an insightful book -well written-much compassion.. Update: 4/20/16 I wrote this review yesterday. I'm still thinking about this family -and the challenges they lived with. After talking to a friend about a disturbing scene-- I have chosen to 'update' this review --to give a 'warning'. That said....its an insightful book -well written-much compassion....with enjoyable -bright textured characters. I suggest reading several reviews! This was an engrossing look at the power of mental illness ---a deeply personal story about what happens when that power overwhelms a family of five. a serious illness from different standpoints --the family: John, Margaret, Michael, Celia, and Alec. What I found admirable, throughout this story, is blame was never a weapon ---however...through the storytelling ....( which feels so realistic), it's clear how messy and complicated it is in trying to help a person with this illness. Very well written--( the multiple perspectives opens our eyes to what an entire family struggles with as a unit). This is a compelling story revealing the human impact for those who suffer directly - and for those who love the sufferer. medications ( what works -- what doesn't ) -- depression -- denial -- feeling helpless --guilt -- shame --isolation --codependency -- feeling empty -- or manipulated --but Adam Haslett wrote a compassionate story...each of the characters warmheartedness -- and their rapport with each other cultivate an inspiring presence -- regardless to limits around bailing others out and or listening to periodic tirades. For family members in distress....this novel is gut wrenching...yet there 'are' many moments of 'Goosie-Good-Feelings', too! What a quietly devastating book. It's written so naturally, just following the lives of its characters over decades without seeming like it's trying to make a statement or push an agenda. Haslett does not shy away from asking some tough questions and doesn't give easy answers. He brilliantly explores the themes of the novel for which mental illness is more of a catalyst than a direct focus. Each of the characters in the five member family who the novel revolves around is as human as 5ish stars. Each of the characters in the five member family who the novel revolves around is as human as any fictionalized character I can think of. In a lot of ways, Haslett's character work reminds me of Anne Tyler's which is as big a compliment as I can think of. Like Tyler, Haslett's compassion for his characters shines through though he makes no attempt to glamorize or justify any of them. Each of the characters lives their own lives, has their own ups and downs and while none of them is defined by mental illness, it is continuously affecting each of them in various ways. Though we're never even told their last name, I recognize each of them, if not necessarily in myself then in other people I know and associate with. And not because I am aware of anyone dealing with the same challenges as this family- but because they're humans just trying to make it through whatever challenges life throws their way. Imagi e Me G ne by Adam Haslett is a 2016 Little, Brown and Company publication. Once more I have chosen a book that is pretty far outside of my normal reading range, continuing on my quest to expand my reading habits a little. I had NO idea what to expect, really, but this novel is truly remarkable in its unflinching portrait of a family coping with mental illness. When Margaret marries John she is fully aware of his bouts with depression, these ‘episodes’ he has, but she is in love with him and Imagi e Me G ne by Adam Haslett is a 2016 Little, Brown and Company publication. When Margaret marries John she is fully aware of his bouts with depression, these ‘episodes’ he has, but she is in love with him and marries him despite the adversity they will face in life. From that point on, the family they have together will often face insurmountable challenges, hardships and incredible pain as they watch the ones they love suffer from a slippery malady that draws them further and further from the love and warmth they need, but can’t seem to digest, as they continue to slide into a dark abyss. First of all, this story is not a sugar coated, watered down for public consumption type of novel. It is realistic and stark, and because of the subject matter, it is heavy with little or no respite. However, the characters are rich, well drawn, and I did care very much what happened to this family. I hoped with them, suffered with them, and cried with them, and you will too. Watching them work so hard to keep their heads above water, but seeing them flail about, drowning as the tide pulls them under, is difficult to watch. But, would I do anything differently? I don’t know. How far do you go for someone you love? Where do you become resigned to their fate? How do manage to let go? While very thought provoking, raw, and emotional, this book is pretty sad and if you are not one who handles that kind of outcome, this is not the book for you. I admit this is certainly not the type of book I would want to read too often, and I usually do steer away for anything that suggests a less than rosy outcome, but I am glad to see someone write such an honest and bold depiction of mental illness, one that will stick with you for a long time to come. I came away with much more insight about those who struggle with this disease and for the families and love ones who suffer through that journey along with them. The Hook Many fine reviews from my GR friends, I saw this book everywhere. When it was on sale in e-book format I jumped at the opportunity to join the fans. The Line Interestingly I did not highlight one word in this book. The Sinker – More was promised than delivered. This is a difficult statement for me to make about a book that has garnered such high praise. I liked it. I didn’t love it. Though well written, Imagi*e Me Go*e left me with little emotional impact. Depression and mental illness a The Hook Many fine reviews from my GR friends, I saw this book everywhere. When it was on sale in e-book format I jumped at the opportunity to join the fans. The Sinker – More was promised than delivered. This is a difficult statement for me to make about a book that has garnered such high praise. I liked it. I didn’t love it. Though well written, Imagi*e Me Go*e left me with little emotional impact. Depression and mental illness are hard subjects to explore. Haslett captures the helplessness of a family to deal with the mental swings of a loved one. Perhaps this one hits too close to home so that decisions made in portrayal of characters and their outcome seem off. Perhaps I didn’t care enough to try to save anyone. Perhaps that was the point. A loved one who is mentally ill consumes a great deal of energy and I just didn’t have it for this book. What kills me is I had Adam Haslett's Imagine Me Gone on my e-book queue for well over six months. Even after the announcement of its inclusion on the National Book Award shortlist, even after reading slobbery reviews of it (particularly the one in the NY Times), even after my trusted friend Julie gave Haslett's short story collection You Are Not a Stranger Here a glowing 5-star review here on Goodreads, I steadfastly kept ignoring its presence on my queue until the Pulitzer Prizes were announced two days ago, when I learned this had lost out to the terrific The Underground Railroad for the coveted honor. Curiosity won out over my aversion to dip into (what every review I've read has highlighted, sometimes pejoratively) a novel about mental health disorders and their effect on the family unit. What a bonehead move it was to delay reading this. I was completely blown away with Haslett's spin on the overly familiar "Familial Dysfunction" genre. It wasn't 'love at first read', though. It took me a while to really immerse myself into the travails of this family-of-five, as related in a revolving first person p.o.v. It becomes immediately apparent that something is amiss with the brood of John and Margaret, intimating something dire is about to unfold (in the present) but Haslett's going to take his sweet time dissecting (via life-long flashback) every little element of the mess intimated at the start. What starts as perfunctory turns painstakingly detailed as the siblings (the loquacious fabulist elder Michael, his younger sibs Celia and Alec), then Mom and Dad, give us pertinent clues that there's something awful brewing in this family's core. Once you think you might have a handle on the root cause, Haslett throws a subtle curveball to alter your perception ever so slightly. Yeah, most assuredly, Dad's going through some major depression issues, which inevitably affect the overall dynamic, but why? And what the hell is up with Michael? Who seems perpetually to be in la-la land, from adolescence through middle-age?? Who is stuck in a soundtrack loop of disco/house/trip-hop/acid electronica/thrash and whose thought patterns and convo are bizarrely in stasis mode obsessing over slavery and reparations White America owes blacks?? The initial slow burn smolders to a crackling inferno by book's end, with every character either being a sympathetic figure, or at very least relatable. The exhaustive exposition evidenced at the start, we end up realizing, is not wasted blah-blah. You end up figuring out early what's going to happen, but it's the whys that will (if you're anything like me and can see yourself in these finely-drawn characters) end up rattling you to the core and render you blubbering by book's end. This book starts with a contemplative tone but is quickly plagued by pages of dragging exposition. Haslett structured his narrative from different viewpoints, with each chapter narrated by a different character from a single family. The focus in the early pages is mostly on the father, John, a reserved man who’s struggled with mental illness but seems to be managing well at this point. Characters are mildly interesting, and Haslett gave them distinct voices. He did include dialogue to break up the large blocks of exposition and add some verve to the story, but it can be annoying to read, as it’s not set off from the paragraphs, nor is it contained within quotation marks. It’s also on the sparse side. In some ways the story in these first 57 pages is too ruminative; the opening lacks punch to hook the reader and therefore requires patience. There’s a strong melancholy feel to all of it, a passivity that Haslett probably felt made sense given the premise but can be a real slog after a short while. Final verdict: A story about a man with depression that starts off depressingly. Skip it. This is a close-knit family, but not so closely knit that everything always holds together. Bits unravel here and there as individuals try to break free of the demands of caring for the people they love but who wear them out. They each have their own ways of antagonising the others . . . but also of caring deeply and looking after the others. Each chapter is told by one member: John and Margaret, the parents of Michael, Celia and Alec. There is a point later in the book where John has come home from work and she knows he’s worried. And that says it all about his background. Don’t talk about it, and maybe it will go away. But it doesn’t. It comes and goes, Margaret’s exhausted with three kids and also because John’s exhausted, since that’s what depression does. Michael is particularly trying. He’s an articulate, difficult young teen (probably “on the spectrum” we might say today), who talks about and collects music. Insightful and bright beyond his years, he is also extremely needy. Actually they are all needy, but Michael’s seems to be a more in-your-face I-NEED-YOU-NOW-OR-ELSE kind of needy. When they take a cruise ship back to England, Michael writes a detailed diary of the voyage, where all the passengers were greased up, chained in irons and sold as slaves at ports along the way. This fantasy introduces both his imagination and his obsessive theory that there is a universal black memory of the slave trade that haunts and affects today’s black society and music. A permanent, genetic haunting that nobody’s acknowledging except him. He also becomes obsessed with black people and certain kinds of music, and I admit I became as exasperated with all these esoteric (to me) musical references as almost everyone in his life is. As an adult, he makes mix tapes, is a DJ, writes music reviews, but smothers the people he loves and fixates on. He catalogues his various medications, but when he’s down, he relies on his family and exes to talk him through it for hours. Each member of the family is a strong character, and I was taken with the fact that all the voices are quite different. I don’t recall ever trying to remember whose story I was reading. We might think we know what WE would do in their circumstances, but when we see Celia, for example, as an adult in San Francisco talking on the phone to one of the others, we watching her slip back into family mode, as most of us do. Perfectly done. John used to play “Imagine Me Gone” with his kids – get them out in a boat, stop the engine, and pretend to nap, telling them they had to figure out how to get them all home. Suddenly he is imagining - What if? Michael is the most annoying character, but he is also so smart and sardonic and funny in his way, and the others have such strong stories of their own, that it’s a very satisfying book. I really loved it. Many thanks to NetGalley and Little, Brown, and Company for a copy to review. All quotations are from the review copy and subject to change. I've put off writing this review for far too long, because I just don't know what to say. It did draw me in at the beginning, but then kept me at a distance from the characters. In the story, a fathers mental illness is passed to one of the sons, and is told through his eyes. While this gave me an inside look at the thoughts and actions of one with such an illness, it also distanced me from the deeper emotions of the family. I was left with a feeling of this is what happened. For me, I really mi I've put off writing this review for far too long, because I just don't know what to say. It did draw me in at the beginning, but then kept me at a distance from the characters. In the story, a fathers mental illness is passed to one of the sons, and is told through his eyes. While this gave me an inside look at the thoughts and actions of one with such an illness, it also distanced me from the deeper emotions of the family. I was left with a feeling of this is what happened. For me, I really missed not having a more personal connection to the story. On the surface, this might appear to be just another story of a middle-class American family, but this book has a lot more to recommend it than that. The core of the story is about the effects of mental illnesses and the drugs that are used to treat them. There are also a lot of musical and literary reference points, and a lot of humour. The book opens at a crisis point involving two brothers staying in a remote cabin on the Maine coast, whose context becomes clear towards the end of the book. Th On the surface, this might appear to be just another story of a middle-class American family, but this book has a lot more to recommend it than that. The core of the story is about the effects of mental illnesses and the drugs that are used to treat them. There are also a lot of musical and literary reference points, and a lot of humour. The book opens at a crisis point involving two brothers staying in a remote cabin on the Maine coast, whose context becomes clear towards the end of the book. The rest of the book is told chronologically over a period of over 25 years. Each chapter is told by a first person narrator (in my edition these were all named in the chapter headings, but I have heard that in others some of the chapters including the opening one were not), and different members of the family add context and variety. There are five main characters, the parents John and Margaret and their children Michael, Celia and Alec. John is British, and has a good job as a venture capitalist, but suffers occasional episodes of debilitating mental illness. In a key chapter of this section that prefigures later events, John takes the two younger children out on a boat, and challenges them to imagine that he is dead and they have to fend for themselves. The first part of the book is largely about the effect of this on each of the children (view spoiler)[, and ends with his suicide (hide spoiler)]. The central figure in the rest of the story is Michael, who is haunted by his father and wants to protect the family, but has mental issues of his own and becomes dependent on prescription drugs which eventually make it impossible for him to lead a normal life. Much of the humour on the book comes from his writing, for example a series of letters he writes on the family's transatlantic sea voyage which gradually become a bizarre fantasy, and allows Haslett to explore his other obsessions: music, literature and the history of black America. Another major subplot is the story of Alec, the youngest child, and his struggles to reconcile the family and his gay lifestyle. How much are we willing to sacrifice to help those we love? Are we willing to put aside our own happiness for a fleeting chance at saving another? When Margaret learns that her fiancée John has been hospitalized for depression, it throws her completely. This is 1960s London and she is a transplanted American, in love with John's professional and public steadfastness and his emotional vulnerability when the two are alone. She knows she must make a choice: should she support John through his time o How much are we willing to sacrifice to help those we love? Are we willing to put aside our own happiness for a fleeting chance at saving another? When Margaret learns that her fiancée John has been hospitalized for depression, it throws her completely. This is 1960s London and she is a transplanted American, in love with John's professional and public steadfastness and his emotional vulnerability when the two are alone. She knows she must make a choice: should she support John through his time of need and marry him despite not knowing whether his illness will return (as it has in the past), or should she try and find a way out, follow a steadier and more certain path? Her decision to put her faith in John and their love seems like the right one at first. The couple raises three children, but Margaret realizes she needs to be the realistic one, the disciplinarian, while John's more mercurial moods endear him to their children. It's not long before it becomes clear that their eldest son, Michael, intense, passionate, and fiercely intelligent, is plagued by many of the same demons his father is. This manifests itself into borderline obsessive emotional attachments with women, and the same type of obsessive belief in certain social causes. As Michael struggles with adulthood, love, employment, and simply surviving on a daily basis, it falls to Margaret and her two other children, Celia and Alec, to care for him, to endure his mood swings and his anxieties, and protect both Michael and their mother from the challenges of a life plagued by mental illness and anguish. But to do so, Celia and Alec must put their own relationships and careers at risk, which becomes a more difficult choice when having to do it time and time again. As you'd expect from a book about a family's struggles with mental illness, Imagine Me Gone is moving and poignant. Adam Haslett, whose previous books ( You Are Not a Stranger Here and Union Atlantic ) dazzled me, is a tremendously talented writer, and he has created vivid, complex characters, none more so than Michael. My challenge with this book, however, is that in telling the book from each character's perspective, Haslett chooses to tell Michael's story through his delusions, fantasies, obsessions, and paranoia. It makes the book, particularly his chapters, difficult to read and understand, and while they give insight into Michael's mind, they don't advance the story in any way. This is a well-told story of a family barely holding themselves together. But while the story is an emotional one, I had trouble connecting with it in many places. It almost seemed that Michael's psychological issues, told in vivid color, dulled everyone else's stories alongside his. But Haslett's writing is still something to behold. NetGalley and Little, Brown and Company provided me an advance copy of the book in exchange for an unbiased review. Thanks for making this available! Ο Haslett επιλέγει την πολυπρόσωπη αφήγηση, από την οπτική γωνία όλων των ηρώων της οικογένειας και μας βυθίζει στον εσωτερικό κόσμο του κάθε μέλους για να μας διηγηθεί την ιστορία της. Η οικογένεια που αποτελείται από τον Τζον, τη Μάργκαρετ και τα τέκνα τους Άλεκ, Σίλια και Μάικλ, δεν είναι φυσιολογική. Στην μέση βρίσκονται η μητέρα Μάργκαρετ και τα παιδιά Σίλια και Άλεκ που προσπαθούν να ισορροπήσουν τις δικές τους ανάγκες με των ανθρώπων που αγαπούν. Η υπόθεση ακούγεται μελαγχολική, μπορεί να προκαλεί έως και δυσφορία, όμως όχι. Η πολυφωνία της αφήγησης αυτό το υπέροχο σύμπλεγμα εσωτερικών αφηγήσεων βοηθάει την διήγηση να γίνεται ανάλαφρη. Βιώνουμε την δυσλειτουργία των ηρώων χωρίς να μας μεταφέρεται εξίσου το βάρος των καταστάσεων. Διότι η κάθε φωνή, ο κάθε ήρωας είναι ξεχωριστός. Άλλος αστεία σαρκαστικός, άλλος ρομαντικός, άλλος αφηρημένος και ξέγνοιαστος. Ο καθένας με το δικό του ύφος και λεξιλόγιο. Το ωραιότερο όμως είναι ότι οι αδυναμίες τους δεν είναι ενοχλητικές για τον αναγνώστη. Μαθαίνουμε τα ελαττώματα τους, διαβάζουμε τα πάντα με συμπάθεια, κατανόηση και ίσως με αγάπη. Διότι ο ίδιος ο συγγραφέας αγαπά τους ήρωες του. Και αυτό μας το μεταφέρει με κάθε μέσο. Η αφήγηση έχει χιούμορ – θα αργήσετε να ξεπεράσετε την αφήγηση του Μάικλ κατά την διάρκεια της κρουαζιέρας, πιστέψτε με- και τρυφερότητα. Ως αναγνώστρια αυτό που εκτίμησα ιδιαίτερα είναι ότι όταν διαβάζω ένα καλογραμμένο βιβλίο, ανακαλύπτω με μία μικρή ενόχληση ένα στήσιμο, μια προσπάθεια του συγγραφέα να βρει όμορφες λέξεις και βαθιά νοήματα και έπειτα να τα κολλήσει με το τσιγκέλι στην ιστορία που διηγείται. Στο βιβλίο του Haslett αντιθέτως, η διήγηση κυλάει τόσο φυσιολογικά, όσο απλή είναι μια αυθόρμητη σκέψη. Το να τις παρουσιάσει με τόση φυσική ευκολία θέλει μεγάλο ταλέντο. Quantas vezes somos confrontados com aquelas situações X versus Y, em que há uma balança imaginária onde pesamos X e Y em pratos opostos?! Um confronto entre Amor e Depressão, abordado com grande complexidade e realismo. A narrativa tem uma passada lenta, mas o seu tema cativante emerge, captando o nosso interesse. Aguentem o primeiro terço sem desistir, pois verão a vossa resistência recompensada! Why I am so drawn to sad stories? Of all the novels that I read, it is the ones full of tragedy that I remember - their sentences rattle around in my head for months and cause me to well up at the most random moments. Imagine Me Gone is one such book, a real heartbreaker. At the beginning, we meet Alec, who has been staying at a Maine cabin with his older brother Michael. The details are still unclear, but it is obvious that something has gone wrong. We then flash back to when the pair were much Why I am so drawn to sad stories? Of all the novels that I read, it is the ones full of tragedy that I remember - their sentences rattle around in my head for months and cause me to well up at the most random moments. Imagine Me Gone is one such book, a real heartbreaker. At the beginning, we meet Alec, who has been staying at a Maine cabin with his older brother Michael. The details are still unclear, but it is obvious that something has gone wrong. We then flash back to when the pair were much younger. Michael is a sarcastic teenager obsessed with music, while Alec is a mischievous kid with a flair for the dramatic. Alternate chapters are told by each family member, including their sister Celia, and parents Margaret & John. Margaret remembers her courtship with John years earlier, and the crippling depression that took hold of him following their engagement. John is still hounded by the illness and fears that he may have passed it on to his children. We follow the siblings as they navigate their lives, growing apart yet still held together by that familial bond. Michael's increasing anxiety is an obstacle that must be faced, but also a challenge that unites them all. "There is no getting better. There is love I cannot bear, which has kept me from drifting entirely loose. There are the medicines I can take that flood my mind without discrimination, slowing the monster, moving the struggle underwater, where I then must live in the murk. But there is no killing the beast. Since I was a young man, it has hunted me. And it will hunt me until I am dead. The older I become, the closer it gets." "For that hour and the three or four that followed, I was lifted down off a hook in the back of my skull that I hadn’t even known I’d been hanging from. Here was the world unfettered by dread. Thoughts came, lasted for whole, uninterrupted moments, and then passed away, leaving room for others. The present had somehow ceased to be an emergency. In fact, it seemed almost uneventful." A very difficult read about mental illness. I had to skim over certain parts due to the manic dialog at times. Wonderful writing, however, for this Pulitzer Prize finalist. Mental illness plagues two generations of an Anglo-American family in Haslett’s moving second novel. Narration duties are split between the five members: father John, mother Margaret, and siblings Alec, Michael, and Celia. By giving each main character a first-person voice, Haslett offers readers a full picture of how mental illness takes a toll not only on sufferers but also on those who love and care for them. John’s descriptions of what mental illness is like are among the most striking passa Mental illness plagues two generations of an Anglo-American family in Haslett’s moving second novel. Narration duties are split between the five members: father John, mother Margaret, and siblings Alec, Michael, and Celia. By giving each main character a first-person voice, Haslett offers readers a full picture of how mental illness takes a toll not only on sufferers but also on those who love and care for them. John’s descriptions of what mental illness is like are among the most striking passages in the book. Michael’s sections are wonderfully humorous, a nice counterbalance to some of the aching sadness. The multiple points of view fit together beautifully in this four-decade family symphony, although I sometimes felt that Celia was one main character too many – her story doesn’t contribute very much to the whole. A powerful read for fans of family stories. I didn't finish this book, so I'm not going to give it a rating, but I really didn't like it. It could be that I'm not smart enough for this novel. It could be I'm not dumb enough for it. It could be that I'm not sympathetic enough, or enlightened enough, or flexible enough, to enjoy this novel. I don't know what the case is, but I got to 51% and I just couldn't take any more. The characters are completely self-absorbed and one-note. The narrative is so convoluted I'm still not sure what was I didn't finish this book, so I'm not going to give it a rating, but I really didn't like it. The characters are completely self-absorbed and one-note. The narrative is so convoluted I'm still not sure what was supposed to have "really" happened and what was all in their heads. The language is weird and not conducive to understanding. The breadth of the novel, the actual time-lapse span of it, is not engaging to me. The multiple points-of-view made it hard to connect with any of the characters, in and of itself. In short, there is too much to explain, so let me sum up: I quit. Having had the privilege of translating Haslett's book into Greek, I'd begin by saying that it is emphatically not an easy read. And not because of the seemingly obvious reason of its subject, but rather for the opposite: the fact that mental illness and suicide are not straightforward calamities, evolving (or devolving) in the rational, causal manner one unfamiliar with suffering of them might imagine. Mental illness is a tangle of thorns within a tangle of thorns: a complex, burdensome life wi Having had the privilege of translating Haslett's book into Greek, I'd begin by saying that it is emphatically not an easy read. And not because of the seemingly obvious reason of its subject, but rather for the opposite: the fact that mental illness and suicide are not straightforward calamities, evolving (or devolving) in the rational, causal manner one unfamiliar with suffering of them might imagine. Mental illness is a tangle of thorns within a tangle of thorns: a complex, burdensome life within the life we're given (without being asked whether we want it or not, or whether we can handle the added, lifelong burden that is mortality), it's a family of one within the family of many, the distorted reflection of a reflection - hence a situation seeming to spread ad infinitum, swallowing up everything in its course. Haslett has written a subtle, quietly harrowing book, a polyphonic masterpiece that defies narrative norms and the usual treatment of thorny issues, and instead delves into the abovementioned chaos fearlessly, indulging its quintessential clamor and discontent. He treats suicide (especially that of a parent) as the perennial landmine it is, maiming and dismembering the survivors till there seems to be nothing left of them at all, other than the grim privilege of belonging to this private group of lifelong trauma. At the same time, he treats the lighter aspects of his characters' lives with the same uncanny precision and wisdom, like a sufferer familiar both with pain and the deliverance from it, the happiness of not having to struggle through each day in a state of constant torment. This book at times hollows you out, it destroys you. But it's a wonder of the book nonetheless, one whose brilliance stays with you. "The beast is a projector too, every day throwing up before me pictures of what I'm incapable of." This novel made me catch my breath. Every reader experiences a story differently, especially when the fiction is close to realities they have lived or witnessed. Anyone having dealt with mental health issues will feel a deeper pain for the characters- every single one of them. Every person in the novel has a pain that is rightfully their own. Such pain doesn't require permission, it is like another "The beast is a projector too, every day throwing up before me pictures of what I'm incapable of." This novel made me catch my breath. Every reader experiences a story differently, especially when the fiction is close to realities they have lived or witnessed. Anyone having dealt with mental health issues will feel a deeper pain for the characters- every single one of them. Every person in the novel has a pain that is rightfully their own. Such pain doesn't require permission, it is like another family member. It all begins with a choice Margaret makes to marry John knowing that something is wrong with him. When the children come along Margaret has to deal with a balance that seems to weigh far more heavily on her side and there are signs their son Michael is different though brilliant. It isn't long before things crumble. As the children grow up, they both love their father and resent his illness. The struggle between the shame and guilt they feel is written beautifully. "I can see in his eyes how hard he's trying not to pity me. This is what I do to them. Over and over." My heart broke so much, and I am reminded of how little we really do to help those who have mental disabilities. It isn't a feel good novel where some cure or solution appears and suddenly everyone is happy and functional. This is a raw look at one family moving forward and coping the best they can, trying their hardest to support their husband, son, brother. But this story took a big bite out of my heart. It's a brave fight for anyone dealing with mental illness themselves or their loved ones. It is depressing and it doesn't have to be this way- this is a tragic tale. There are people that are finding great treatment and support, and those who aren't should be and deserve it. But this story is heavy and isn't positive, but some stories do end in tragedy. If anything, I think this sheds light on just how much families need support as much as the person suffering through their illness (mental or otherwise). We all need someone to lean on, we can't always just be a rock. There is still a big stigma on mental illness regardless of what people lead you to believe. Much of the ignorance is fear based , and there is so much more that needs to be done because everyone deserves a fruitful life. We really should explore the human mind more. [4+] Imagine Me Gone, about the toll of mental illness on a family, crept up on me gradually. I probably would have abandoned it after a few dozen pages if not for Haslett's wonderful writing. Page by page, I become more involved with each family member until they all felt like family to me. This is a heartbreaking and loving novel. “Imagine Me Gone” will be on many “Best of 2016” book lists. This amazing read illustrates how mental illness is exhausting, time consuming, and financially devistatiing for the friends and families of those sufferers. Mental illness affects not just the ones who have the illness; mental illness affects the sufferer’s loved ones as well. Although the subject matter is depressing, author Adam Haslett adds laugh-out-loud humor to balance the read, to make it more readable. 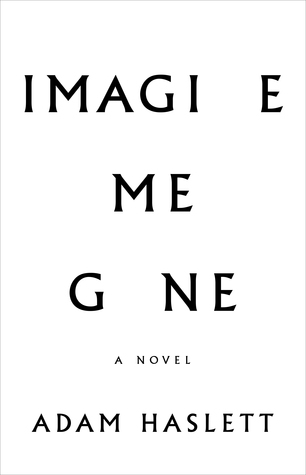 The novel begins at the e “Imagine Me Gone” will be on many “Best of 2016” book lists. This amazing read illustrates how mental illness is exhausting, time consuming, and financially devistatiing for the friends and families of those sufferers. Mental illness affects not just the ones who have the illness; mental illness affects the sufferer’s loved ones as well. Although the subject matter is depressing, author Adam Haslett adds laugh-out-loud humor to balance the read, to make it more readable. The novel begins at the end: Michael, the eldest of Margaret and John’s children has died while staying at a vacation home in Maine. His younger brother, Alec, was with him. Haslett goes from there to the beginning. Told from Margaret’s (the mother) point of view, Margaret tells of her introduction to John (father). A few months before their wedding, Margaret discovers that John suffers from bouts of severe depression with the severity so bad that it necessitates hospitalization. This part of the story takes place in the mid 1960’s, and both the doctors and parents aren’t as forthcoming about the illness as they could have been. Margaret blindly goes into marriage with John and has three children with him. The reader learns from Margaret the difficulty living and parenting with an unstable person. Michael, the oldest of the children provides the most entertainment in the novel. His mind is fast and it’s always churning. He’s imaginative and clever, and he has an anxiety disorder. Half of his chapters are hilarious. The other half showcases the agonizing and paralyzing thoughts of his unquiet mind. John’s(the father) chapters are sad. He understands his flaws and the heartache it brings to his family. He is aware; he just can’t do anything about it. The reader sees how he is immobilized by his disability. Haslett is astounding in using Michael and John to illuminate to the reader the horrific inner worlds of mental illness. Haslett is no stranger to these illnesses. In an NPR interview he revealed that his father killed himself when Haslett was 14 and his brother suffered from an anxiety disorder. Haslett used his life experiences to bring reality to this novel. The voices of the siblings, Alec and Celia allow the reader to understand how siblings and children of the afflicted are in constant worry and frustration. Mental illness is soul-sucking and distracting. Growing up is difficult under the best family situation; this adds another layer of family dysfunction. For me, one of the most illuminating pieces of this novel is the pharmaceutical issue. Mental illness is fluid; it’s difficult to gauge the ebb and flow, thus thereby difficult prescribing the correct type of meds in the correct doses. The body builds tolerances to some meds, which requires upping the doses. Additionally, the side effects of some of the meds out-weigh some of the benefits. This is a novel that is brilliant on so many levels: it gives light to mental illness; it gives voices to those affected; it enlightens those who know individuals and families suffering; it questions proper treatment of those afflicted. And finally, it’s a fabulous read. This read is beautiful and insightful. It’s at times heart-wrenchingly devastating. At other times it’s witty and fun. It’s a slice of life. I highly recommend it. I could NOT put this book down! I laughed , I cried, I sobbed. . . This story, these characters will stay with me for a very long time. I felt Celia’s portrayal of a social worker was spot on, and I personally learned so much from her. I learned so much from this family! 4.5 stars - This is a heart breaking story of a family and their struggles to deal with mental illness. I listened to the audio and really enjoyed it. Я не знаю, бывают ли в Америке семьи не с тремя детьми; судя по художественной литературе, нет. Авторы настойчиво сообщают миру, что там, где трое детей, дела обычно идут не очень (сюрприз! ), а счастья на троих не хватает совершенно точно никогда. Imagine Me Gone не отступает от канона: у нас есть сын-всезнайка (Майкл), дочь-спортсменка (Силия) и младшенький (Алек), которого все шпыняют. Папа - добрый и британец, но без пяти минут безработный. Мама всегда заказывает в ресторане самое дешевое блюд Я не знаю, бывают ли в Америке семьи не с тремя детьми; судя по художественной литературе, нет. Авторы настойчиво сообщают миру, что там, где трое детей, дела обычно идут не очень (сюрприз! ), а счастья на троих не хватает совершенно точно никогда. Imagine Me Gone не отступает от канона: у нас есть сын-всезнайка (Майкл), дочь-спортсменка (Силия) и младшенький (Алек), которого все шпыняют. Папа - добрый и британец, но без пяти минут безработный. Мама всегда заказывает в ресторане самое дешевое блюдо и мечтает остановить мгновение, чтобы хоть раз посмотреть на детей, а не только слушать и отвечать на их непрекращающиеся вопросы. Чтобы как-то развеяться, семья уезжает на дачу, но мы-то знаем, что в плане развеяться уединенный домик в лесу у озера - точно не самый подходящий вариант, особенно если у папы - наследственная клиническая депрессия. Хронология романа построена нелинейно, и мы то едем с Маргарет в Англию знакомиться с будущим мужем, то бежим с Алеком на электричку, чтобы не опоздать на рождественский обед, то узнаем, почему Силия прогуливала работу прошлым летом. Дети растут, и каждый из них приятно похож на себя в детстве, но уже вооруженного граблями. Самые классные грабли - у Майкла, они ему достались от отца, и примерно всю книгу другие члены семьи пытаются понять, что же им делать с этими горе-садоводами. Центральная тема романа, да и не только она, сильно перекликается с "Маленькой жизнью" (очень видно, что автор ее читал, у него даже есть свой Виллем! ): взаимоотношения страдальца (я не паясничаю) и любящих его людей. Нужно ли спасать? Можно ли спасать? Можно ли спасти? Как поддержать, как дать не погибнуть, а если не дать, то как быть с собственной совестью? Где заканчивается любовь и начинается давление? Откуда брать силы, а также терпение, доброту и деньги на лечение? This was an incredibly moving & vivid story! While mental illness is a very serious issue for a novel, the author somehow manages to convey the desperate intensity along with writing eloquently & beautifully about the family bonds and even making me laugh out loud at times. It is a work of art. When I wasn't reading it, I was thinking about it. Το μυθιστόρημα "Κι αν εγώ χαθώ" του βραβευμένου Αμερικανού Adam Haslett, που κυκλοφορεί από τις εκδόσεις Μεταίχμιο, είναι ένα από εκείνα που διάβασα το καλοκαίρι και με προβλημάτισε σε πολλά επίπεδα. Θα έλεγα πως μου δημιούργησε την ίδια αμηχανία με το "Still Alice", αφού και τα δύο έχουν κοινό πυρήνα. Τι θα κάναμε αν ένας πολύ δικός μας άνθρωπος, ένας άνθρωπος που τον αγαπάμε, αντιμετώπιζε ένα πολύ δύσκολο πρόβλημα στο οποίο, ίσως, δεν μπορούσαμε να συνεισφέρουμε με τον κατάλληλο τρόπο. Ο λόγος Το μυθιστόρημα "Κι αν εγώ χαθώ" του βραβευμένου Αμερικανού Adam Haslett, που κυκλοφορεί από τις εκδόσεις Μεταίχμιο, είναι ένα από εκείνα που διάβασα το καλοκαίρι και με προβλημάτισε σε πολλά επίπεδα. Θα έλεγα πως μου δημιούργησε την ίδια αμηχανία με το "Still Alice", αφού και τα δύο έχουν κοινό πυρήνα. Τι θα κάναμε αν ένας πολύ δικός μας άνθρωπος, ένας άνθρωπος που τον αγαπάμε, αντιμετώπιζε ένα πολύ δύσκολο πρόβλημα στο οποίο, ίσως, δεν μπορούσαμε να συνεισφέρουμε με τον κατάλληλο τρόπο. Ο λόγος της αμηχανίας μου αυτής έχει να κάνει με δύο πράγματα. Πρώτον με το πως θ' αντιμετώπιζα εγώ μια παρόμοια κατάσταση, άρα με προκάλεσε ηθικά, και δεύτερον με το πως θ' αντιμετωπίσει το βιβλίο κάποιος που δεν έχει ιδέα τι σημαίνει να έχεις στην οικογένειά σου ένα άτομο με ψυχολογική διαταραχή οποιασδήποτε μορφής. Η Μάργκαρετ είναι μια νέα γυναίκα που θα βρεθεί μπροστά σ' ένα πολύ μεγάλο δίλημμα, όταν ο αρραβωνιαστικός της διαγνωστεί και νοσηλευτεί με κατάθλιψη. Ή θα πρέπει να τον εγκαταλείψεις και να συνεχίσει τη ζωή της μακριά απ' αυτόν, ή να σταθεί στο πλευρό του και να τον στηρίξει, υλοποιώντας τα όνειρα που έχει κάνει μαζί του. Τελικά, επιλέγει το δεύτερο, με τους δυο τους να δημιουργούν οικογένεια και ν' αποκτούν τρία παιδιά. Η Μάργκαρετ, όμως, ξεχωρίζει στην καρδιά της το μεγαλύτερο εξ αυτών, τον Μάικλ, που αν και είναι ένα χαρισματικό πλάσμα, πάσχει από αγχώδη διαταραχή, μια συνθήκη που όλοι μαζί προσπαθούν να τον βοηθήσουν να την διαχειριστεί όσο καλύτερα γίνεται, δεδομένου ότι η κατάστασή του ολοένα και χειροτερεύει. Σε μια ιστορία όπως αυτή θα ήταν δύσκολο, έτσι κι αλλιώς, να διαχειριστεί κανείς την ψυχοσύνθεση ενός και μόνο ατόμου με ψυχολογικές διαταραχές, αν κι εφόσον είναι σε θέση ν' αντιληφθεί πόσο σοβαρές είναι αυτές, αλλά και πόσο επικίνδυνη μπορεί να είναι η εξέλιξή τους. Σκεφτείτε, λοιπόν, να πρέπει ν' αντιμετωπίσουμε δύο ασθενείς οι οποίοι, μάλιστα, βρίσκονται σε δύο εκ διαμέτρου αντίθετα άκρα. Ο μεν Τζον, εξαιτίας της κατάθλιψής του, έχει ένα μόνιμο αίσθημα κενότητας, σαν κάτι να του λείπει και να μην είναι πλήρης, ώστε να μπορέσει να νιώσει πραγματικά ευτυχισμένος, ενώ ο γιος του, Μάικλ, τα βιώνει όλα τόσο έντονα και δυνατά, που το να νιώθει είναι επίπονο και οδυνηρό, οδηγώντας σε έκρυθμες συμπεριφορές και ξεσπάσματα. Και ανάμεσα σε αυτούς τους δύο πόλους, βρίσκονται τα υπόλοιπα τρία μέλη της οικογένειας, που αν και απολύτως φυσιολογικά, δεν μπορούν να έχουν μια φυσιολογική ζωή, γιατί ο άξονας αυτής είναι προβληματικός και δυσκίνητος. Η αφήγηση δεν θα λέγαμε πως έχει ιδιαίτερο νεύρο ή ένταση, κάτι που μπορεί να κουράσει κάποιους αναγνώστες, αλλά πρέπει να έχουμε στο πίσω μέρος του μυαλού μας πως ο Haslett δεν είχε πρόθεση να δημιουργήσει ένα μυθιστόρημα που θα καθηλώσει με τις εξελίξεις του, αλλά που θα προβληματίσει, θα συγκινήσει και θα προσφέρει τροφή για σκέψη στον αναγνώστη του, πράγμα που πετυχαίνει στο μέγιστο βαθμό. Και μπορεί η αφηγηματική τεχνική του να φαντάζει κάπως επιτηδευμένη στα σημεία, με τον ίδιο να προσπαθεί να μας εντυπωσιάσει με μια γλαφυρότητα που -ίσως- είναι υπερβολική και αχρείαστη, όμως την ίδια στιγμή, έχει καταφέρει να δημιουργήσει ένα σύμπλεγμα χαρακτήρων ολότελα διαφορετικών μεταξύ τους, που ως μονάδα είναι απόλυτα ολοκληρωμένος, και που ως σύνολο, σε αλληλεπίδραση με τους άλλους, συμπληρώνει αυτό που χρειάζεται προκειμένου όλο αυτό να λειτουργήσει.